The talk beforehand was centred on the size of what Garcia carried between his legs in actively pursuing the fight, and rightly so. In an era when fighters often look for excuses not to fight, he should be applauded for finding the right reasons to target one of the best at 147lbs. He wanted what we all want from our prizefighters, great wins, an A-lister in the opposite corner, to challenge himself and that keyword we hear launched like confetti at a wedding, legacy. But when Garcia said it, we did not condemn it as hollow because he was putting his career where his mouth was. He was putting it on the line. 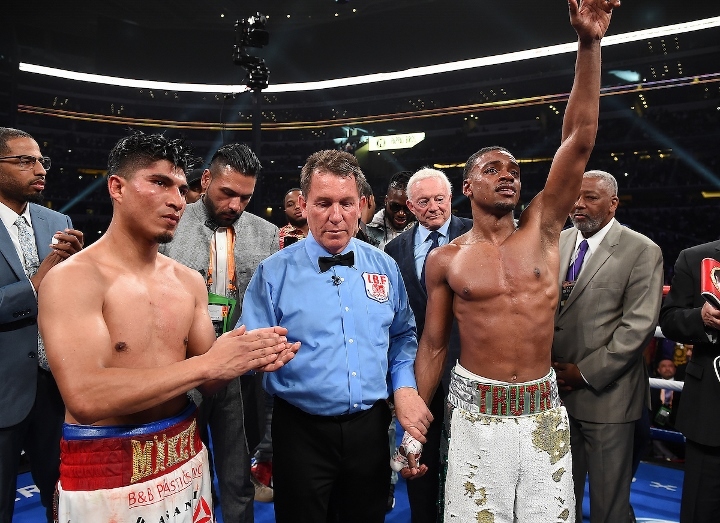 Spence opened as the favourite, of course, but by the time the fight crowd arrived in Dallas more than a few had been swayed by four-division champ Garcia’s bravery and ambition. Spence was good, solid, capable. Garcia was great, or at least he was daring to be. An extraordinary little guy could beat a very good big guy. We heard clichés trotted out, we had heard about De La Hoya-Hopkins, of Leonard-Hagler and of Pacquiao-De La Hoya. Different fighters. Different fights. Different era. A similar plot does not always hold the same ending. [QUOTE=factsarenice;19597130]Spence has lightweight on lock down. [/QUOTE] Call him out, you will get you wish and some more! "I see something" has now been lost in the mix! !